Question: How is it possible that I’m Swedish, from Wisconsin, and have never-before-now had creamed pickled herring in all my years of existence? Answer: Because it’s gross, that’s why. contemplated, but ultimately decided against, stealing a green chair from the Memorial Union Terrace to complete a friend-who-shall-remain-nameless’s already impressive collection of stolen terrace chairs. But the highlight of our trip was dinner at The Old Fashioned, a newish restaurant on the Capitol Square that’s devoted to spotlighting the foods and spirits that make Wisconsin famous — everything from to obscure artisanal microbrewed beers to braunschweiger to bratwurst to old fashioneds. Which are always, always made with Korbel brandy, at least in Wisconsin. I didn’t know that brandy wasn’t considered the traditional, universal base for old-fashioneds until I married The Husband. It may even have been the subject of our first domestic argument. The first four items on The Old Fashioned’s menus are some pretty serious local cheese plates, but we skipped right ahead to Numbers Five and Six: lazy susans. Five was Scandanavian-themed, featuring cured smoked Norwegian salmon, smoked lake trout, creamed herring, pickles, rye toast and crackers, pickled beets, and creamy potato salad; Six was Germanic, and had summer sausage, garlic salami, braunschweiger, mustard, coleslaw, deviled eggs, sweet pickles and rye toast. We thought about ordering both, but in order to save room for the beer-battered deep-fried cheese curds, we just went with the Number Six. The smoked trout and cured salmon were amazing; the former had just the right amount of salt, while the latter was creamy, fatty and silky. The pickled beets had a tiny hint of spice — coriander seed, maybe? — and the rye toast was better than you’d believe. The potato salad tasted just like my mom’s, which is probably the highest compliment possible. But the creamed herring — which is basically lightly pickled raw herring served with dill- or horseradish-spiked sour cream — took a bit of courage to tackle. It’s not attractive. It’s white and lumpy, and when you poke at it with your fork, it’s a weird textural cross between springy and squishy. But I figured generations of Scandanavians couldn’t be wrong, so we slopped some onto rye toast points and: down the hatch. It turns out that I was wrong about Scandanavians being wrong. The herring was, um, not my favorite. Which I was actually kind of surprised by. I love all kinds of oily little fish — sardines, smelt, trout, mackerel, anchovies — and while dill isn’t my favorite, I’ve got nothing against sour cream. And sometimes things that look disgusting, like pate or tuna casserole, are totally delicious. 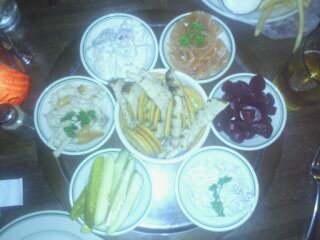 But the creamed herring’s texture was the nail in the gustatory coffin. It was like eating, well, I’m not sure. I’ve been sitting here for ten minutes trying to figure out how to describe what it felt like. Not quite pencil eraser, not quite sponge. Not quite raw fish and definitely not cooked fish. Too firm to be jello or custard, too soft to be meat. Have you ever eaten a defrosted strawberry, which is kind of slug-like and slippery? Kind of like that, but fishy. And gray. 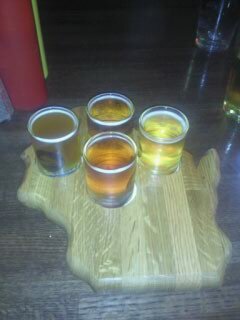 Fortunately, the beer-battered deep-fried cheese curds were deeply badass, as was the beer flight, which was served on a custom-carved Wisconsin-shaped wooden board. I should note that the phrase Fatty Boombalatty was not only the name of one of the beers we ordered, but how we felt as we lumbered back to the hotel. Wisconsin, you are indeed King. I hear it’s a traditional first baby food in Sweden… just kidding. note 1: i love your writing style. note 2: i once ordered a beet salad, thinking “radishes”. when the pickled beets arrived i was like “what HAVE YOU DONE to the radishes?!? !” i ate the whole thing even though pickled beets look a little like cranberry sauce but are 1/10th as delicious. true story. Thanks, Dan! Though I disagree with your math. Beets are exponentially more delicious than cranberry sauce. And I’m saying this as someone who actually likes cranberry sauce. You had me at Beer battered deep fried cheese curds, Fatty Boombalatty and deeply badass. Awesome. Creamed herring, not so much. Thanks for helping me cross that one off my list of things to try, blech.